What if Jesus suddenly appeared and announced that he planned to run for President of the United States? Yes, that Jesus. And what if a well-meaning but utterly inexperienced band of disciples not only helped him mount a seat-of-the-pants campaign but ran it well, getting millions of people to support him and, in the process, throwing the two major-party candidates—as well as the world’s news media—into a frenzy as they scramble to discredit him? Roland Merullo’s bitingly clever satirical novel about politics follows the campaign of one man to bring goodness and kindness (real goodness and kindness this time) back to a country that has fallen into a divisive state of fear and hatred. 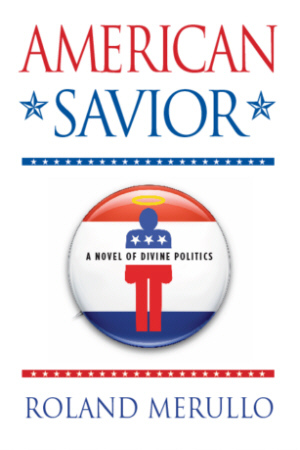 Merullo takes us into the heart of “a nation in grave spiritual danger” as the Son of man sets out to make everyone realize that “politics as usual” is no longer an acceptable alternative.American Savior challenges our perceptions and beliefs while it wags a finger at the folly of our self-righteousness. It is sure to cause controversy among those for whom politics itself has become a kind of religion.